An explosion and clashes took place just hours after the funerals of 11 Revolutionary Guard members who were killed in a bomb blast in southeast Iran on Wednesday. This is the third major attack by insurgents on the regime in the Sistan-Baluchestan Province this month! Clashes between armed militants and police have erupted in the south-eastern Iranian city of Zahedan, state media have reported. Police sealed off the area and exchanged fire with the attackers after a bomb went off, Irna news agency quoted an unnamed official as saying. It comes two days after a car bomb in Zahedan killed 11 Revolutionary Guards. A hardline Sunni group, Jundallah, said it carried out Wednesday’s attack. Iranian officials have accused Britain and the United States of supporting ethnic minority rebels operating in the Islamic republic’s sensitive border areas. 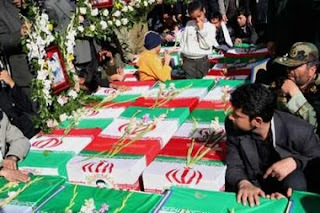 The explosion and clashes took place just hours after the funerals for the 11 Revolutionary Guards. The governor of Zahedan, Hassan ali Nouri, told Fars news agency that the explosion was caused by a percussion bomb – a device which produces a large bang but causes little damage. “The gang has been ordered by some foreign states to plant bombs in specific places and escape the country simultaneously,” Gen Ghaffari said. He added that police had found a number of weapons and explosives in a house “where members of the terrorist group Jundallah were getting prepared for another operation”. Zahedan is the capital of Sistan-Baluchestan province, which borders both Afghanistan and Pakistan. It has a substantial Sunni Islam Baluch community. 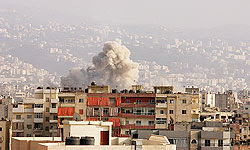 Kamangir is following the developments from the Iranian news. A picture from the Fars News website on the clashes and explosion in Zahedan. Aryamehr has a much different take than what we are hearing in the Western press. From the initial details of the blast, this appears to be a planned ambush of Iranian security forces. By placing the noise bomb in front of the police car, the perpetrators were able to draw the police to the area of the attack, where they could then fire on the officers. There are no details as of yet on the number of attackers or security forces involved. Reports: Armed Clashes Against Iranian Regime in Isfahan Province! Explosion in Iran Kills Busload of Al Quds Members! !